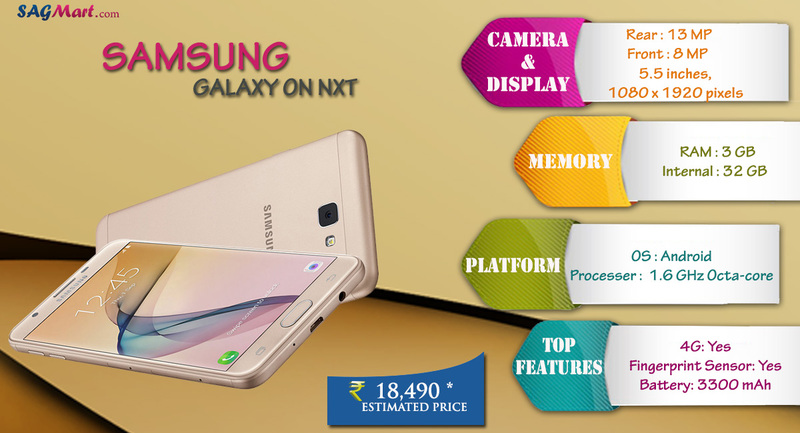 Samsung Galaxy On Nxt comes with S Secure and fingerprint sensor and S-secure along with 5.5-inch Full-HD touchscreen display. The device is powered by a 1.6GHz Octa-core processor along with 3GB of RAM and 16/32/64 GB internal storage, expandable up to 256GB by using microSD card. It houses 3300mAh Non-removable Li-ion Battery and sports a 13-megapixel rear camera along with 8-megapixel selfie shutter. The Dual SIM device runs on the Android 6.0 Marshmallow Operating System. On the connectivity front, it offers 4G LTE, 3G, Bluetooth v4.1, microUSB 2.0, Wi-Fi 802.11 b/g/n options.